This is the time of year when a lot of folks are talking about back-to-school shopping. They’re talking about how much money they’re spending. They’re talking about making special road trips to shopping malls with bigger and better stores. They’re talking about how difficult their kids are about buying clothes. And worst of all, they’re talking about finally paying off their credit card bills from last year’s back-to-school shopping. My plan is to avoid all of that. You see, my family doesn’t go back-to-school shopping, at least, not in the traditional sense. We don’t believe sales fliers, a calendar, and societal pressure should dictate the need for an entire new wardrobe for our kids each and every fall. Instead we have a strategy for stockpiling kids clothing. We watch sales year-round, and we only buy the clothing we need when it is at a great price. In the meantime, we take care of the clothing we have, and try to make it last as long as it can. 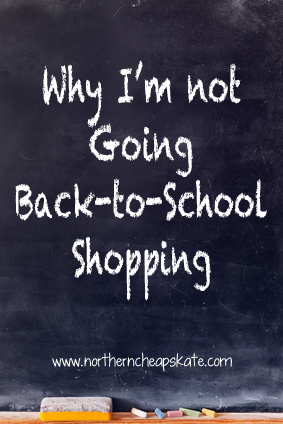 It’s a strategy that has made back-to-school shopping unnecessary for us. We’re fortunate in that the boys have summer birthdays. Any new clothing items they got for the birthday are new to most of their friends, so a new outfit for school isn’t necessary. And since we keep close tabs on their clothing needs year-round, we’ve got what we need in the right sizes as well as the next size up. The high quality backpacks I bought two years ago (on sale, of course!) are still in great shape, so there’s no need to buy new ones. They’ll also re-use last years pencil boxes, rulers and scissors. The only back-t0-school shopping we’ve done this year is to replenish the consumables like pencils, erasers, glue sticks, notebooks and crayons. We’ve been using our back-to-school shopping strategy to stock up on the items we didn’t already have in our stockpile. Our method works well. There are no drawn out arguments in the stores. There’s no stress on our budget during a busy time of year. We get to enjoy our last couple of weeks of summer vacation without having to set foot in a shopping mall. So the next time you go shopping – regardless of what you’re shopping for – ask yourself why you need to shop at that exact moment. Are you shopping because you truly need something? Or is it because everyone else is shopping and telling you to shop, too? The answer could save you time and money. That’s really good advice! I wonder if that strategy works with girls? My grand daughter is starting third grade and I can’t believe all the brand name shoes & clothes she’s picked out (but she’s certainly not getting). Oh, and she’s requested we go on Amazon.com and get her the pink, LED lighted chandelier for her locker. Wow. That’s tough. Her peers (and their parents) have definitely bought into a commercial lifestyle and that’s probably driving her. The lesson that needs to be taught is that the alternatives not only save money, but are better. For example, saving money by not buying all the junk allows you to do other things instead. No locker bling means it is easier to find your things. The worst part about back to school shopping is the lists that are generated by the schools in what seems like an arbitrary fashion. I can’t begin to understand why my 7th grader requires crayons and glue sticks. So, good for you. You’re definitely not wasting any money by sustaining from shopping. Well, 7th graders still do art and they also do graph-type things… The biggest problem I have with the school generated lists is that they are often brand specific. You have to buy Fiskars scissors even though there may be store brand scissors that work just as well for half the price. That’s awesome, Angie! I love how you’re paying it forward! We buy our kids a first day of school outfit and the supplies they need for their teachers and that’s pretty much it. I buy shoes when they out grow them and we like to hit consignment sales in the fall and spring to save money. My kids go with me so they see it as shopping and don’t even realize they are second hand clothes. At least not yet. This is more “not going clothes shopping”and not really “back to school shopping.” This is the exact shopping millions of people do every year -buying school supplies. The majority of schools have uniforms, anyway. Where I live, there are actually very few schools that have uniforms. Back-to-School shopping for clothes has become a cultural norm. But we also try to avoid buying things (like backpacks, scissors, pencil boxes) that last multiple years. We never started the popular northern Minnesota tradition of school (clothes) shopping, when our (now almost 19 year old) oldest son started school and have kept it that way with our six other children after him. We don’t make a big deal about it, so it’s not a big deal. Like you, I find bargains throughout the year and I’m also a thrift store junkie. To our kids, new-to-me items are just as exciting. Because we never started it, the kids don’t even really know it’s a “thing” and have never asked. They generally get to wear one of the new pairs of shoes that they NEED (and I bought on clearance several months earlier). ? Aside: I remember my (single parent) mother stressing about how she was going to afford our back-to-school shopping, which we did yearly, and (when I was young), I thought was just something we had to do. As an adult, I grew to understand it’s a silly, wasteful tradition and my husband (who also grew up “back-to-school shopping) and I decided, for our family, it ended with us.